In the "old" Google Search Console (and Google Webmaster Tools) there was an option to Mark as fixed to clear errors once fixed. This allowed us to keep the error list clean and only show errors that are still relevant. In the "new" version of the Search Console, where is this option? Currently, there is no "Mark as fixed" Option in the new Google Search Console. However, when you identify errors, you can click on "Validate Fix" which will get the error into "Processing" State until they are cleared (Passed). As mentioned in the above comments by Stephen, it is misunderstood by lot of users how the functionality works correctly. The "Validate Fix" works better and often takes a lot of time to get processed. We can wait for Google to see whether they are willing to bring this feature back in the new Search Console. Not the answer you're looking for? Browse other questions tagged google-search-console crawl-errors or ask your own question. 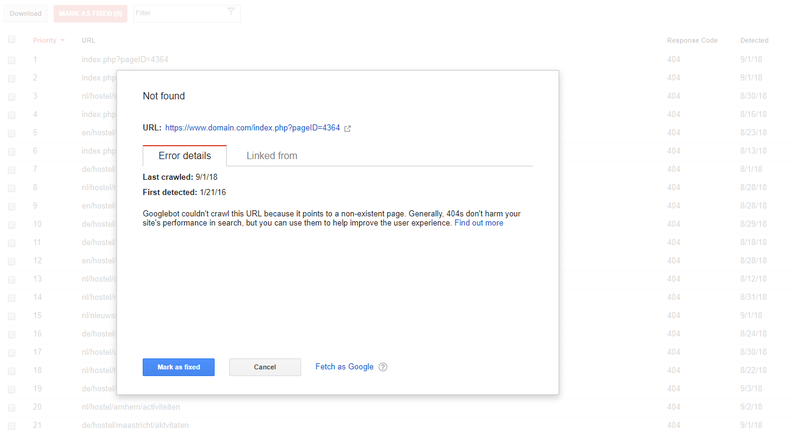 How can I clear the “crawl errors” of Google webmaster tools? Should I 'mark as fixed' deleted pages in Google Webmaster Tools?